Learn more about how very young children acquire the language and phonemic awareness skills that will help them become strong readers, warning signs of delayed development, and how parents can support their child's literacy skills through meaningful conversation and read alouds. Every child is unique and has an individual rate of development. This chart represents, on average, the age by which most children will accomplish skills in hearing, understanding, and talking. Identifying a reading problem is a challenge without a sense for what typical literacy development looks like. 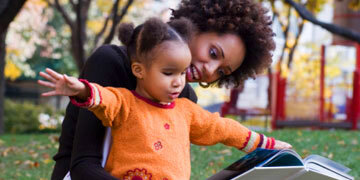 Find out what language accomplishments are typical for most children from birth to age three. Hosted by Fred Rogers, The Roots of Reading looks at the earliest stages of literacy in such locations as a baby speech lab and a Head Start center. The show examines how parents, childcare providers, and kindergarten teachers can get children started on the road to literacy. This program is part of our PBS Launching Young Readers series about how children learn to read, why so many struggle, and what we can do to help. A child&apos;s success as a reader begins much earlier than the first day of school. Reading, and a love for reading, begins at home. Our one-page Parent Tips offer easy ways for parents of babies, toddlers, preschoolers, and kindergartners to help their kids become successful readers. (in English and 10 other languages). "Get Ready to Read" is a free, research-based, and easy-to-use screening tool. It consists of 20 questions that parents and caregivers can ask a four-year-old to see if he or she is on track for learning how to read. It&apos;s never too early to start looking for ways to help your child succeed in learning. This article covers children who are under 2 and who are in pre-school. They have rights under the Individuals with Disabilities Education Act (IDEA). Find out the first steps to take if you suspect your child has difficulty learning. In this one-hour professional development webcast, Todd R. Risley, Sharon Landesman Ramey, and Julie Washington discussing research-based strategies for developing language and pre-reading skills in young children. Browse our library of selected research studies that investigate issues important to early literacy and preschool, including evidence of the effect of quality preschool on school readiness and characteristics of quality pre-K programs.